Finding a good baby shower cake inscription to use does not have to be hard, it can be a piece of cake! When putting an inscription on a cake, you will need to keep the saying as simple as possible. Keep in mind that the more words you have, the less space you have to write it. If you would like to use a cake poem that is longer, it might be best to print it up to display near by the cake. Otherwise you might have a really sore hand and your guests might need to pull out their glasses to read it. Yikes! Here are some ideas to use for your cake wording. You can also pull wording from nursery rhymes or books to match with your theme. Our Family Is Growing By Two (Or Four) Feet. Diapers and Pins, the Fun Begins! Thank Heaven For Little (Boys) Girls! 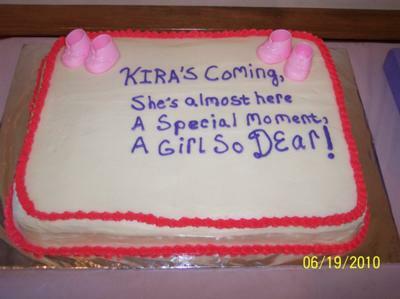 Kira's coming, She's almost here, A special moment, a girl so dear! Frost your cake and smooth. Hold the icing bag at a 45 degree angle with the back of the bag to the right. Lightly touch the tip to the cake surface and squeeze bag to start the letter. When you reach the end of the letter, stop squeezing and lift the bag up. Instead of using your wrist to write the wording, move your arm as a whole. Use your other hand as a support to keep your writing hand steady. Stand. I know it sounds silly, but if you are standing you are less likely to slant your wording. If you are a perfectionist, or have a hard time with straight lines, getting the wording perfect can take time and be a little frustrating. You can "cheat" a little by writing your wording on wax paper with a pencil. Take the wax paper, reverse it and place over the cake. Use a toothpick and prick around the edges of your letters.